Tethered • Run Hard. Rest Well. A large, noisy machine gives life to my 21 year old son, every minute of every day. Josh is in Hospice Care and he is utterly dependent on an Oxygen Concentrator that delivers 8 liters of 02 to his lungs 24/7. Josh lives a tethered life. For all the power found in that expensive machine, it’s useless without a $5, 50-foot length of green tubing and a $.50 adapter. Useless. In our early days of Josh’s Hospice Care (and scared out of our minds) we had a number of little crises that taught us the value of the tether. Josh’s life depends on it. We live and serve and are sustained by the infinite, Almighty God. In Him we have all we need and more, but there has to be a delivery system. There are multiple delivery systems, but the one that tethers me most fully to the best of what God has for me is the time I set aside to rest. Rest is a mysterious thing to me, especially Sabbath rest. As a type A, work-horse human being, rest does not make logical sense to me. Even after years of being committed, I still do not understand the “how” behind it, except that it changes me. Re-creates me. Refuels me. Connects me to God through a means not of my own doing. It is a mystery, a beautiful mystery, a mystery I’ve come to love. God’s Sabbath command is remarkably simple. Halt. Stop. Cease. Plenty of people do that these days, but their halting is limited to mindless entertainment and addictive amusements. There is nothing wrong, in moderation, of choosing to relax and unwind through the entertainment we find in TV, movies, cell phones and social media. It just can’t be the whole shebang. What is a rest that truly restores? It’s a rest done with intent and a mindfulness that I am participating in what God deems holy (Genesis 2:3). 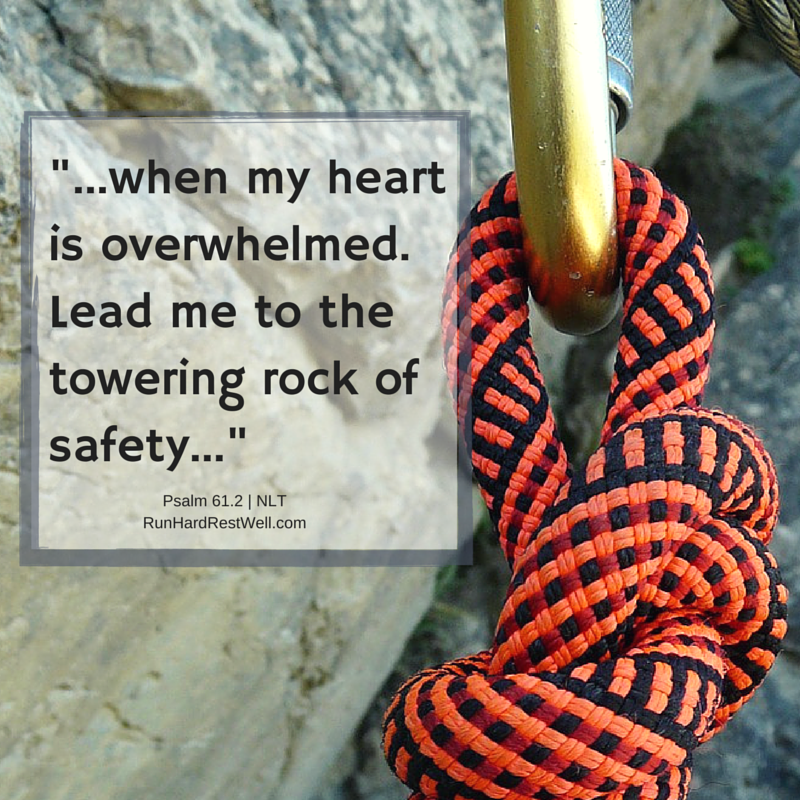 It is fully anchored in the towering Rock that never fails (Psalm 61:2). Rest is a matter of the heart. It’s a tether I will never live without. Thank you, so much. I’d never thought of being tethered to an oxygen tank and being tethered to God. Yes, I know about being tethered! I know about tubes. They are annoying, restrictive, and absolutely essential. Doggoneit! To be connected to God that way…to see Him as a feeding tube, an oxygen tube, an IV…that blows my mind, but I need that tether more than any other, and I desire Him more than anything else. My food, my air, my water, my life’s blood…all come from Him! WOW! Brenda, I saw the picture of Josh at the mall for his birthday yesterday. When did he go back into hospice? Josh has actually never been out of Hospice Care since entering it in August, 2013. His first months were really rough, but then he leveled out. Last spring and most of summer were amazingly “good” and that was such a blessing since Joe was in the hospital for 7 weeks during that time. What I’ve come to find out is that Hospice Care is an option when medical knowledge indicates that the person has less than 6 months to live. Some people actually go to work and are in hospice care. I always thought it was an “end of life” care option when people were bed-buond. Not so, even though that’s what many people think. Josh is just an on-going miracle! Yes, Brenda, he is that. I knew he had home care. I thought “hospice” was a place and a “this is it…now” situation. I guess, because Josh has so much life in him, it’s hard to get a grip on how horribly sick he really is at times. I know that, but I forget. I think that would suit him just fine. He wants to known for who he is and not defined by his health. None of us do.